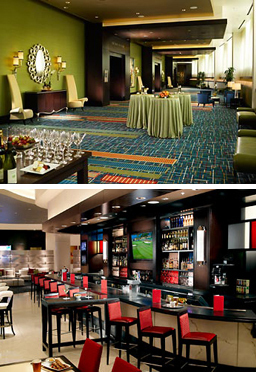 Only a two-minute ride away from the world’s busiest airport via the ATL Skytrain lies the Gateway Marriott at GICC. This full-service hotel has 403 guest rooms, including a dozen executive suites and a concierge level with lounge. The prime location is geared for business, and the facility offers over 21,000 square feet of meeting and event space ranging from 500 square-foot conference rooms to a 10,000 square foot ballroom capable of hosting an 800-seat banquet or a 1200-person reception. The facility is also directly adjacent to the 400,000 square-foot Georgia International Convention Center, which hosts a broad range of events. 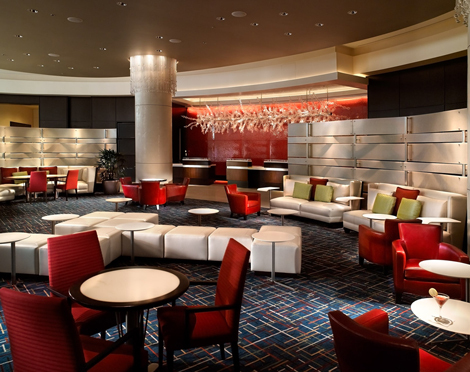 Relaxing amenities include a full-service lobby lounge and bar anchored by Champions, an upscale, sports-themed bar and restaurant featuring a distinctive round bar, chef’s table and private dining room. 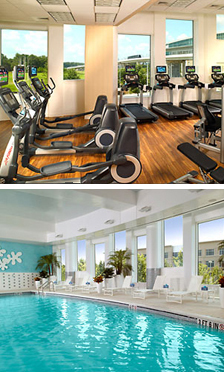 Other amenities include a well-equipped fitness center and indoor saltwater pool. Interior Designer: Marsha Davis & Associates in association with RJTR.